What very few people know is that chamomile is a versatile herb with an abundance of medicinal and therapeutic values. Most people have heard of the well known medicinal herb called chamomile. Many of you have probably sipped some warm, soothing chamomile tea at one time or another and you may even have some in your kitchen cupboards. It is a very popular herb due to its relaxing effect and naturally sweet flavor. What very few people know is that chamomile is a versatile herb with an abundance of medicinal and therapeutic values. A simple tea infusion of the flower is a general tonic, mild sedative and a digestive aid. It is a great evening drink that will help you unwind and take a deep breath. Try it alone or with peppermint an hour before or after a meal to help you digest your food. For a special treat you can add milk and honey to your tea, although chamomile has a subtle sweetness to be appreciated. On a sunny day it can be fun to make a sun tea with this delightful herb. Be creative and mix some of your favorite herbs together in a glass jar with water and let them brew in the sun all day. At night fall you take out the tea bags or fresh herbs and put the tea in the fridge for a refreshing summertime drink just waiting to be poured in a glass. Chamomile is also good for helping with chronic restlessness and insomnia. It’s worth trying this and other herbs that may have a stronger sedating effect before taking other drugs that may be addicting and have other adverse effects. Chamomile is also a great herb for infants and children because of it’s pleasant flavor. It is especially useful for baby’s with colic. Care providers can teaspoon small amounts of tea to infants or give them chamomile baths. Breastfeeding mothers can offer their babies this herbal remedy through breast milk by drinking the tea themselves. Pregnant women who experience morning sickness may find some relief by slowly sipping a warm tea in the morning or anytime during the day. This herb can also be very beneficial used externally. This often comes as a surprise to people. Muslin bags filled with the flower can be added to bath water to aid relaxation and relieve sun and wind burnt skin. You can use a tea bag compress on your eyes to reduce inflammation or fatigue around the eyes. A compress of the flowers is used to treat wounds and eczema on the skin. The dried leaf and flower can be used as a potpourri and as the filling for a soothing herb pillow. The possibilities go on and on. 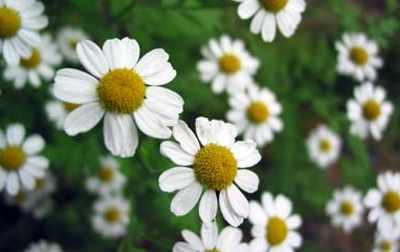 Chamomile is very easy to come by and is also simple to cultivate in your own garden. The plant produces sweet daisy like flowers and small apple scented leaves. This is an herb anyone can benefit from and is always a good friend to have around.